Born and raised in a family of concrete finishers, it was never a question of if Josh was going to go into the concrete field, it was when. That question was answered when Josh graduated High School and started Real Help Concrete with the help of Jon Herod at the age of 18. Al, Josh’s grandfather, laid the solid foundation for not only him, but the rest of his family to get into the concrete business. The Broad name has been associated with concrete in the Buffalo area for the past 60 years, and Josh intends to make it another 60 years. Throughout your job, from estimate to completion, Josh will be a part of the process working with the office staff, install crew, and detail crew ensuring your job runs as seamless as possible. Josh is always looking forward to working with you to design and install your next concrete project! Jon can be seen on almost every job site, overseeing and working side by side Real Help Concrete’s installation crew. Starting a landscape business at the young age of 16, Jon learned first hand what it takes to run a business and gained valuable experience along the way. Once Real Help transitioned from landscaping to concrete, Jon took his previous experience, coupled with his new desire to create elaborate concrete designs, and helped shape Real Help Concrete into what it is today. Working alongside the installation crew, Jon carries the vision and attention to detail necessary to carry out the projects we do. On site, Jon will be your main point of contact with questions or concerns as the project evolves from beginning construction to completion. Keith has been in the concrete industry for over 30 years. From foundations to patios, Keith has done it all. From the young age of 15, Keith has been around concrete, working with his Father Al. After working with his brothers for over 20 years, Keith made the decision to come help his son, Josh, and Jon, grow and develop Real Help Concrete. Keith has been with Real Help since the start and we truly value him as an asset. With Keith’s knowledge and experience, we utilize him in every aspect of construction. From beginning to end, Keith will have his hands dirty working towards beautifying your yard through concrete! Kris is known as “Kustom Kris” by the crew, because that’s exactly what he is; Custom. Working alongside his brother’s and father, Kris was exposed to decorative concrete at a young age. Since the age of 15, Kris has been dealing solely with residential concrete, especially decorative concrete. Over the past 30 years, Kris has completed thousands of stamped concrete projects. Varying from driveways to pool surrounds, Kris has stamped a lot of concrete! Kris has an attention to detail that our customers have come to love! Laid back, yet hard working, Kris is involved in your project from set-up to completion. Kris takes special attention in taking time to teach the crew members below so Real Help Concrete can continue to provide quality concrete services for years to come! Tom has been working with decorative concrete for the past 8 years. Having experience in pool surrounds and stamped concrete, Tom was the perfect fit for Real Help Concrete. After finishing his second season with Real Help Concrete, we are anxious for what the next season will bring with Tom. Tom has already proven to be valuable to the Real Help team and he is an asset on the jobsite. We believe that Tom will continue to learn from Keith and Kris, and will continue to grow personally and professionally as he continues with Real Help Concrete for years to come. Ron, although new to Real Help, is not new to concrete. Ron has been working with concrete since he was 18 years old. Ron has worked on many concrete projects, ranging from footers to patios. Ron expressed his interest in the 2016 season when meeting with owners Josh and Jon, that he was looking to establish himself within a residential concrete company and be a part of their growth and success. Ron has a great mindset and an even better attitude while on the jobsite. We are glad to have Ron as part of the installation team, and we look forward to him working with us for years to come. The future of Real Help Concrete looks bright! Heading up the detail crew, Zach has an excellent eye for detail and ensures your project area is clean after installation. Zach and the detail crew handle the job once the installation team is complete doing their job. All custom coloring and sealing is done by Zach and the detail crew. Real Help Concrete recently started a sister concrete maintenance company, Buffalo Concrete Sealing, and Zach is a big part of that company as well. Zach is great with customers, answering questions and handling concerns. With Zach being the last pair of eyes that see your job before we are complete, we are confident that your project will be left the way it should be. Chase has been with Real Help the entire 2016 season. On the jobsite, Chase ensures the crew has everything necessary to complete the job in a timely manner. Chase is also tasked with loading and unloading the trucks, ensuring the equipment is clean and operable, and in charge of taking care of the setup trailer. Chase is a great compliment to the Real Help installation team, and his light spirit and great attitude is welcomed by all members of the team! Chris has experience in various trades that he has picked up throughout his construction career after graduating from Alfred State with a construction trades degree. Chris has a smart head on his shoulders and has picked up concrete detail quickly. New to Real Help in 2016, Chris is eager to grow with the company and help build Buffalo Concrete Sealing. Currently, Chris aids in concrete detail, coloring, and sealing. We look forward to entrusting Chris with more responsibility as the 2017 concrete season approaches. Contacting the office for an estimate? Calling to check on scheduling? Have a question regarding concrete? 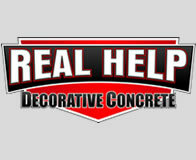 Debbie will be your first point of contact when you contact Real Help Concrete. Debbie is the voice behind our phones. Having a history in customer service and quality control, Debbie is the perfect person to have in our office. We believe that your experience with us starts with your initial phone call, and we believe we have the right people in place every step of the way to provide excellent service through and through. We are glad to have Debbie as a part of our team. Please, give her a call at 716-997-3058 and see why everyone loves our office staff!